It wasn’t all that long ago when the value of software was measured in menus. Rich, versatile apps from Adobe, Quark, and Corel put the tremendous power of their apps on full display, using every inch of available screen real estate to make as many tools, options and pallets accessible in an instant. But mobile devices have shown us a better way. With a smaller canvas to work with, today’s apps put a premium on space and focus, streamlining bars and menus and eliminating all but the most relevant options. The trend toward minimal workspaces and windows is evident all across the desktop app landscape, but no other category has benefitted more from the mobile movement than text editors. Desk PM is one of the standouts of the new school of text editors. When it was released late last year it positioned itself as a tool for bloggers rather than casual writers, offering a simple place to both write and publish. One-click integration with many of the popular platforms (WordPress, Blogger, Tumblr, etc.) gave Desk a unique edge over its similarly styled competitors; in a crowded clutter-free sea it carved out its own wave and rode it right up the App Store charts. But alongside the release of version 2.0, Desk also decide to diversify its lineup. Where the original incarnation of the app was a relatively high-priced publishing machine at $30, the two new apps under its umbrella—Desk MarkDown (MD) and Desk Note Taking (NT)—scale back the scope of the app in interesting ways. They’re not companions so much as lite versions, offering users put off by Desk’s original $30 price a cheaper way to try out the experience. It’s a kind of twist on the in-app-purchase model; rather than paying to unlock new features, Desk users will instead choose the app that has the features they want. On the surface, all three versions of Desk are virtually identical. The vast majority of the window is still comprised of a large writing ares, but now a bolder menu is nicely pinned to the right edge, and there’s a fresh Yosemite-inspired design that extends a cleaner look across the whole family. The only visible differences between the three versions are slight; Desk PM and MD have three icons that NT does not: share, quick publish and send by email. Even once you start using them, the differences aren’t much more apparent. Aside from the inability to share or publish your work, NT offers everything PM does, from the font options and writing modes to WYSIWYG formatting. Conversely, MD offers full sharing and publishing, but removes all traces of WYSIWYG editing (including easy table inserting), relying solely on the user’s knowledge of Markdown. As far as writing goes, however, you can’t go wrong with any of them. The canvas is spectacular as either a floating window, full screen or split-screen in El Capitan, as are the various modes and styles (though it’s hard to imagine a use for the nearly-invisible transparent mode). Font choices are fairly limited, but there are enough layout and formatting options to create a comfortable workspace. It lacks any sort of organization for documents, but iCloud Drive integration at least ensures you won’t lose track of anything, and a handy preview button will show you how your document will look when published. Also, a useful set of stats along the bottom counts words, characters and reading time as you type. and while bloggers will certainly appreciate the quick publishing buttons (the main appeal of MD and PM), but a way to customize the share menu with standard exporting options would be appreciated. But with such a similar interface across all three versions, choosing the right one to buy can be tricky. Even if you have no interest in blogging, the lack of any kind of sharing in Desk NT can be frustrating, and even the staunchest Markdown devotee might still miss WYSIWYG writing. Adding to the complexity of the purchase is the pricing structure. With version 2.0, Desk PM slashed its price down to a downright desirable $20, putting a de facto $5 premium on each of the three versions (NT is $10 and MD is $15). However, since the App Store doesn’t allow for any kind of upgrade system, getting the full slate of features after buying Desk NT would require an additional purchase of Desk MD, bringing the total to $25, more than you would have spent on Desk PM in the first place. 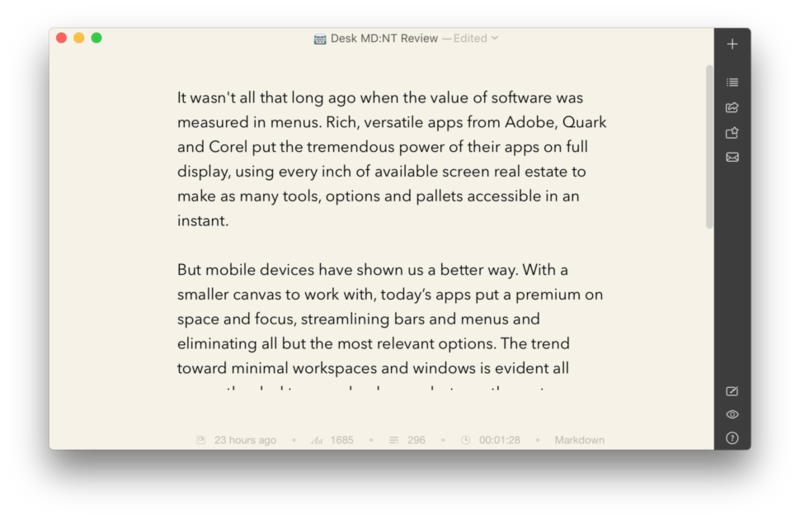 In a perfect world there would be one version of Desk with in-app purchases to unlock Markdown editing and blog publishing, but unless your budget won’t allow it, it’s hard to recommend either Desk NT or MD over PM. The extra options are well worth the $10 and you don’t have to worry about what you might be missing. 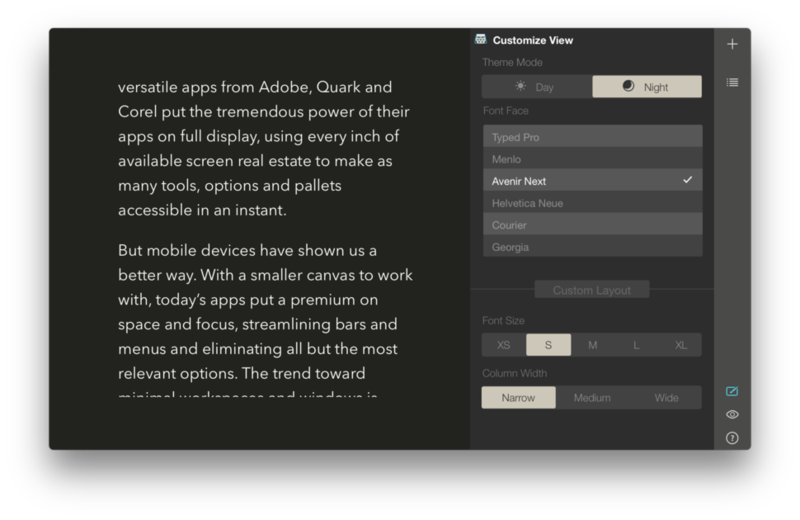 Desk is still one of the best text editors in the App Store but the expanded lineup adds little more than confusion.